iOS 11 brought some significant new features to Apple’s most popular operating system, with the iPad in particular getting plenty of love. With features like improved multi-tasking, a macOS-like Dock, and enhanced drag-and-drop support, the iPad was indeed the star of the show as far as the previous major upgrade to iOS is concerned. There were plenty of new iOS 11 features common to both iPhone and iPad, including a revamped App Store, the Files app, the ability to customise Control Centre, and a whole lot more that was easy to miss at first glance. While iOS 11 was arguably the biggest iOS release since iOS 7, on the face of it, iOS 12 seems to have much more modest ambitions in comparison. Instead of brining in radical paradigm shifts, it aims to change how we use our devices in small, but meaningful ways. Over three months after its official release, let’s take a closer look at what it’s been like to use iOS 12 on the new iPhone models — iPhone XR as well as the iPhone XS and iPhone XS Max. Perhaps the most noticeable new feature is the change in how iOS handles notifications. If you are in the habit of enabling notifications for every new app that you install without giving it much thought, you probably deal with a lot of interruptions every day. It seems that we Indians have a higher threshold for noise on our phones — perhaps something to do with the noise all around us in our everyday lives — but trust us when we say you’ll like your phone a lot more if it didn’t beep and vibrate every time there’s a new offer. The App Store’s terms don’t permit this, by the way, though Apple chooses to look the other way for literally every single app — but we digress. 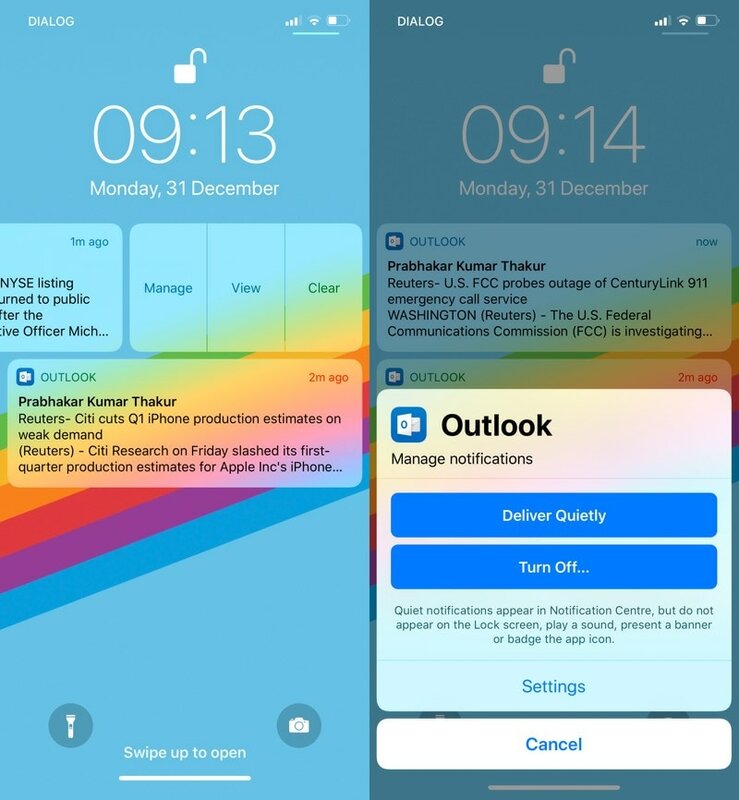 iOS 12 lets you tweak the notification settings for any app when you see a notification from it on the lock screen or in the Notification Centre, instead of forcing you to dive into the Settings like before. Just swipe left on any notification and you’ll be presented with three options — Manage, View, and Clear. Tap Manage and you’ll be shown options to tweak your notification settings right there, without deep-diving into Settings, increasing the likelihood that you’ll do something about unwanted notifications. Over time, iOS also detects which apps you don’t interact with and will offer to disable notifications from them or deliver them quietly, straight into the Notification Centre, without bothering you. You can manually choose to do that as well, of course. Even the way notifications are presented is different, with ones from the same app or event (like a group chat in Messages) now grouped by default. This means you won’t see dozens of notifications on your screen just because there was loads of back and forth on an email thread, or because the iMessage group with your cousins suddenly blew up. You can change this behaviour and go back to seeing individual notifications, if that’s what you prefer. Next up is Screen Time, a feature similar to Google’s Digital Wellbeing, that’s designed to give you more information about how you — and your kids — use iOS devices. At the highest level, Screen Time shows you information about how long you actively use your devices every day. You can dive deeper to see additional details such as your most-used apps as well as your usage across various app categories such as Entertainment, Social Networking, Productivity, and more. 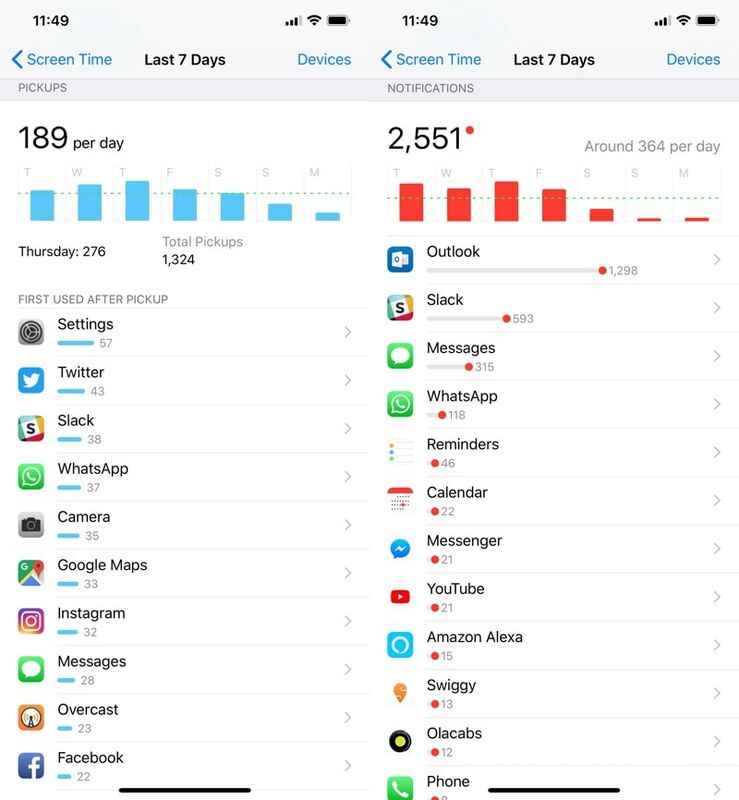 This is a useful way to get a deeper understanding of how you actually use your device, and if you have more than one iOS (12) device, you can choose to see combined reports depicting your usage across all devices. You can also check the number of times you pick up your device through the day (the number will almost certainly surprise you), and even which apps send you the most notifications, which you can then keep in mind to manage notifications using ways that we mentioned earlier. You can even go beyond mere reporting and choose to act on this data by setting limits for certain kinds of apps by, say, limiting social networking apps to two hours a day. Then, if you are using the Twitter app, for example, you will get a warning five minutes before your limit runs out, and once you are out of time you the app will be disabled. 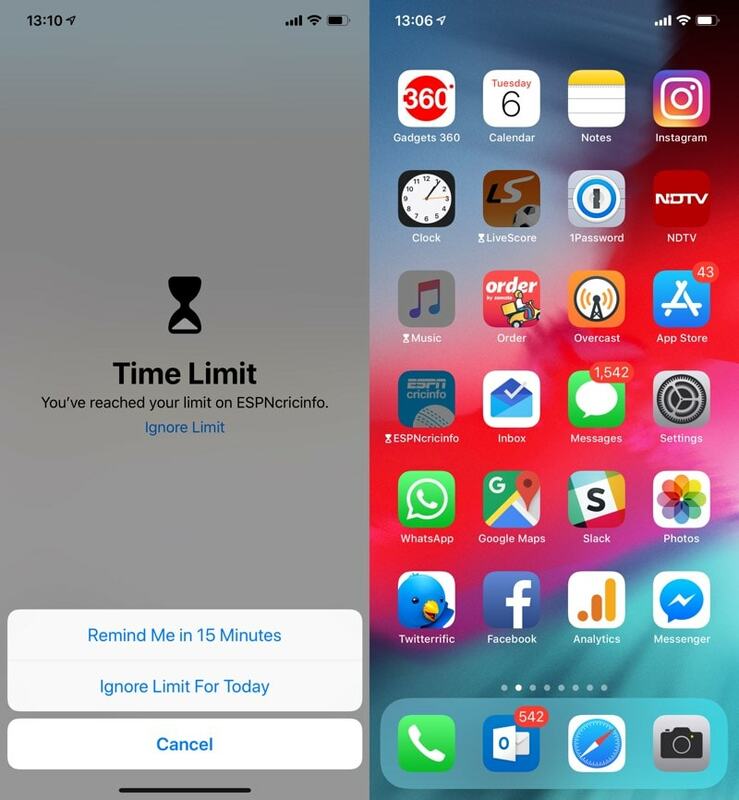 You have the option to Ignore Limit by granting yourself an extension of 15 minutes, or ignoring the limit for the rest of the day. You can even have exceptions to allow specific app(s) after the time limit for that category has been reached. 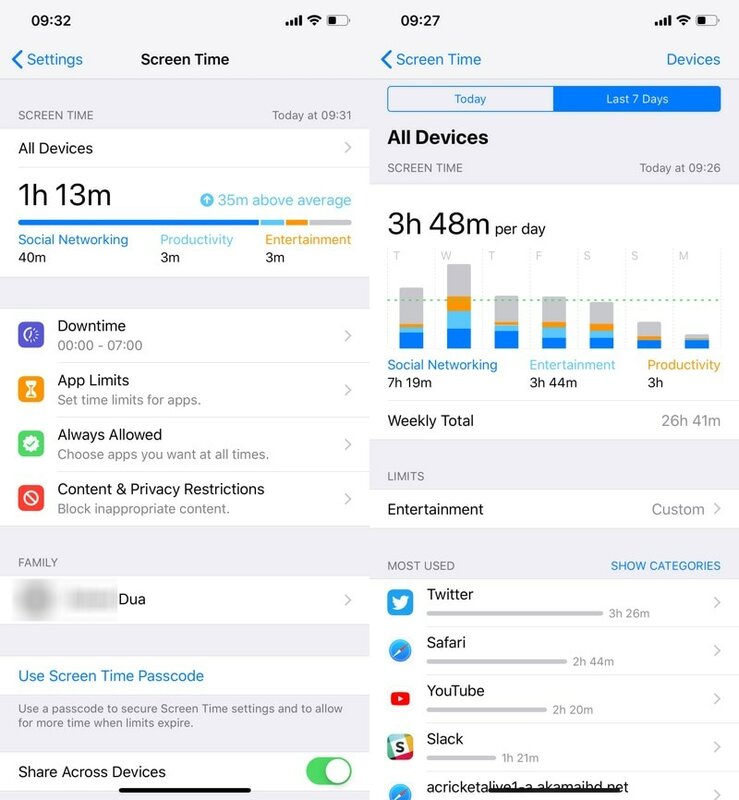 Screen Time also includes the parental controls that iOS has offered for some time now. These allow you to lock down the settings of your device and/ or the kind of content that can be viewed using the system’s default media apps. All these controls can be put behind a Screen Time Passcode, allowing a business or a parent to lock down a device — and prevent the user from overriding these limits and other restrictions. 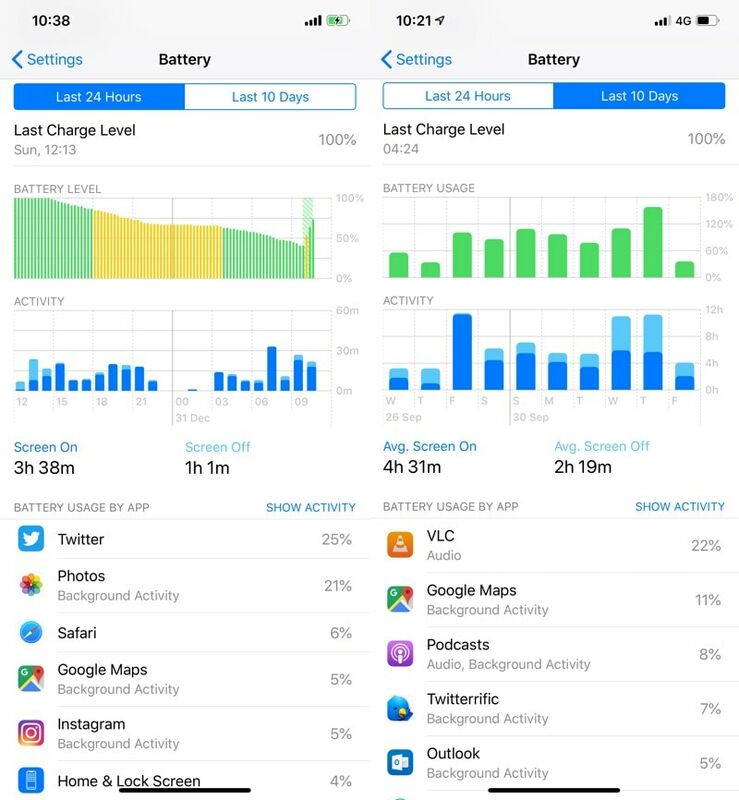 If you are a parent, Apple has made it even simpler for you to monitor your kids’ device usage and grant them additional permissions as and when necessary via iCloud’s Family Sharing feature. You can see detailed reports of how your kids have being using their iOS devices, and if they want to, say, request 15 minutes of extra YouTube time to finish watching a video they are really into, a request will pop up on your iOS device in real time for you to reject/ approve. While we loved the Screen Time feature and found it to be really useful, we would like to see a couple of improvements. First, we would like to see Apple integrate macOS usage into Screen Time. As much as we love our iPad Pro, we still spend most of our day at the office and at home in front of a Mac, so to see a Screen Time report at the end of the day that reports mostly “Entertainment” and “Social Networking” usage instead of “Productivity” (which largely happened on the Mac) can be rather, well, disheartening. We understand that there are challenges in reporting app usage statistics on a system like the Mac where multiple apps/ windows can be open on the screen at the same time, but it’s a problem that’s been solved by third-party apps on the platform, and Apple can go down the same route. On the iPad Pro, for example — which also lets you have multiple apps on the screen at the same time — Apple clocks time towards all apps that are visible on screen. Yes, the same approach will almost certainly not translate to the Mac where you can have overlapping windows and partially visible apps, but we trust that Apple can find a satisfactory solution. The other frustration stems from the fact that if you request an extension — whether for 15 minutes or for the rest of the day — once you hit your daily limit, it applies only to the specific app that you were trying to use. The rest of the apps in that category will continue to be disabled and you need to extend the limit on each of them individually. We would also like the ability to override the default categorisation of apps, and have certain apps classify as, say, Productivity instead of Entertainment. Right now, the classification is based on the category each app is listed under on the App Store. But by far and away our favourite feature in iOS 12 is the ability to autofill one-time passwords (OTPs) in nearly all apps with just a single tap. If you live in India, you’ve come to accept OTPs as a way of life. We need to deal with them every time we use our debit or credit cards online. OTPs, of course, are also used as part of two-factor authentication by many online services, while others use them as a fallback (or even the only) way to let you log in into your accounts. Entering OTPs is a pain, and typing ‘662342’ when you wanted to enter ‘662432’ is, sadly, way too common when you have to enter the numbers manually. Android apps have found a way around this by prompting you to give them access to your SMS messages, so they can see when you’ve received an OTP and automatically authenticate you. Needless to say, giving an app access to your entire history of text messages for three seconds of convenience is a terrible idea, but far too many people don’t realise this and just go with what’s easier. iOS doesn’t allow third-party apps to access your messages — though some of these restrictions have been loosened a bit recently, under specific conditions — so until iOS 12, iOS users had no option but to enter their one-time passwords manually. The latest iOS version has its own OTP parser that automatically detects incoming OTPs and gives you the option to enter them without switching apps. This works across websites and majority of third-party apps as well (including apps with embedded Web views, with a couple of exceptions), eliminating a major hassle and making the experience of dealing with one-time passwords a breeze. Before iOS 12 — with which Apple spent a lot of time and effort improving the performance of older devices — there were concerns about slowing adoption rates of new major iOS versions. Many have attributed this to bad experiences with iOS updates — which have often slowed down devices or significantly worsened battery life for many users — that may have put some people off from installing updates promptly. Companies like Apple want to make sure you are running the latest version of software your device supports, as it makes your device more secure, makes sure developers can target the latest versions of the APIs that Apple provides, and reduces the overall cost of supporting you as a user. If too many people start holding back on updates — which many believe has happened over the last couple of years — it’s a problem for Apple, and not just because it can no longer boast numbers that it loves to show off during those keynotes. It’s against this background that iOS 12 offers automatic software updates, designed to make sure you are always running the latest version of iOS. Now, to be clear, the process isn’t as “automatic” as the term might suggest. For starters, you need to opt in to automatic updates when you are setting up your iPhone, and you can just as easily choose to say no, if you so desire. That might change one day — Chrome and Windows 10 show that such a move wouldn’t exactly be without precedent — but for now, you can rest easy if you like the ability to control when your software updates are installed. Second, though the feature is designed to install software updates overnight (or when your phone is being charged) after they’ve been downloaded (when you are on Wi-Fi), Apple notes that you might still see prompts before the updates are installed, which is exactly what happened with us. So much so for “automatic”. Another big highlight of iOS 12 is support for Siri Shortcuts and the Shortcuts app. While some have used the two terms interchangeably, there’s a big difference. The former is a way for apps to expose commonly executed actions that can now be triggered via shortcuts. When you invoke Siri search — by swiping down on the home screen — in addition to the Siri app suggestions, you might also see suggestions for various commands that you can execute with one tap, without having to launch the said app and then look for the option. This can range from messaging someone you texted recently, to calling your Mom via WhatsApp.